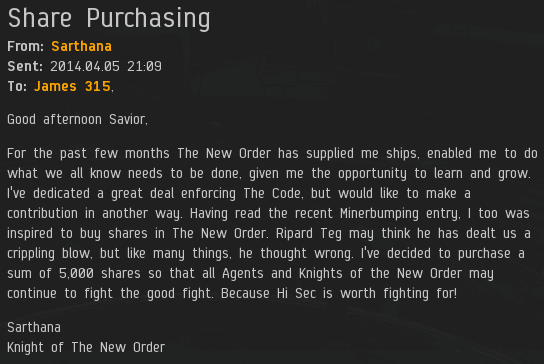 Things are heating up in highsec. We just passed two million hits on MinerBumping, and now we're tantalizingly close to the 300 billion mark for New Order shares. But enough introductory text. I know what you're here for. You want to see some milestones and Supreme Protector's Tips of the Hat™. You won't be disappointed. First off, frazejita Paaltomo's purchase of an additional 150 shares put us over the 291 billion mark. frazejita earns a Supreme Protector's Tip of the Hat™. Here's where things get interesting. That's karma for you. The New Order puts good out into the universe and gets good back. Sarthana's purchase of 5,000 shares put us over the 292, 293, 294, 295, and 296 billion marks. Sarthana earns a precious Quintuple Supreme Protector's Tip of the Hat™! Cato XIII's purchase of an additional 2,000 shares put us over the 297 and 298 billion marks. Cato earns a Double Supreme Protector's Tip of the Hat™, which is nothing to sneeze at, either. Awesome! Together we can make highsec a better place. Two Heroes of High Sec, Sarthana and Cato XIII.